That’s how the separate aspects relate to each other for a typical recording and here’s a range of examples based on some of the different uses of Hallelujah by Leonard Cohen from the album Various Positions, © Bad Monk Publishing (BMI) 1985. Alexandra Burke (artist), Leonard Cohen (writer), Sony BMG (recording owners), Bad Monk Sony/ATV (publishing owners) and Jeff Buckley, k d lang, Leonard Cohen and others (performers) would be paid in different ways. Each role has its own way of collecting the royalties. The payment for each rights-owner depends on what their work is used for. There are different rates for different uses (ringtone mechanicals are different to CD mechanicals for example). Some media pay and others don’t. In this example the song publisher Bad Monk is adminstered by Sony/ATV and assigned to BMI in the USA for performance licensing. * Jeff Buckley died in 1997 but his performances still earn money. His band on this recording included Gary Lucas (guitar), Mick Grondahl (bass), Matt Johnson (drums) and their earnings depend on their contract for the session. PPL earnings not shown would include: Leonard Cohen (Sony), Jeff Buckley (Sony Columbia) and k d lang (WMG Nonesuch). The other named performers on those tracks would also qualify for PPL royalties. A royalty is the rights-owners’ share in a transaction, there are many different kinds of royalties. You may also hear royalties mentioned for the use of technology patents e.g. CD media or Blu-ray players. Most commercial IP owners expect some kind of royalty income. There may also be earnings from other licenses. Payment for live performance is straightforward—no new rights are created. The venue pays performers or their agent directly, and the song owners are paid through the PRS venue license. If recordings are used in a live performance the recording owner and performers are paid through the PPL venue license. See also Collecting royalties for public performances. *UK adopted the European Copyright Directive (EUCD) in 2003 and the meaning of broadcast performance was broadened to cover “communicating to the public”. This includes transmitting ringtones to mobiles and Internet distribution of music downloads. Payment for recordings is more complicated. 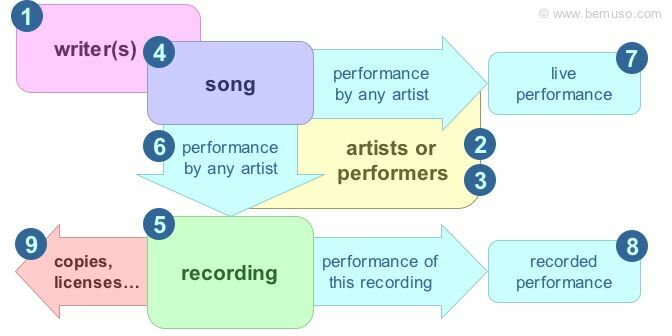 Recordings are stored performances by the original performers, and there are at least three rights-owners on every recording. Publishers and writers are paid by MCPS, PRS, and licensees. Record labels are paid by PPL, retailers and licensees. Performers are paid by the label or through PPL. Any existing copyright or phonographic copyright can be licensed by MCPS, PRS and PPL if the owners choose. Royalties are paid to artists, writers, recording owners and performers for use of their work (this is often commercial use but not only commercial). MCPS and PRS will pay 100% direct to writers without publishers (self-publishers) or 50% direct to writers who have a publisher (in this case the publisher will also pay part of their 50% to the writer). PPL pays 50% to the recording owner and 50% to performers: featured performers (65%) and other performers (35%). PPL pays royalties direct to UK featured artists and others previously paid by P@MRA or AURA. The performers share of the phonographic royalty is only paid for commercial recordings made since 1946 and played or broadcast in public since 1 December 1996 in the UK or overseas. Performers use a Performer Identification Number (PID) from the PPL Performer Registration Centre (PRC) to claim their royalties. This is how royalties are paid from music licensees through collection societies to the rights-owners. There are other licenses that earn royalties for rights-owners. For library music MCPS runs a joint scheme which arranges licenses from the main three societies (MCPS, PRS and PPL). For commercial music web sites MCPS-PRS Alliance offer a joint online license (JOL) to cover copying and performances for publishers. These sites also need a PPL license. It covers any copyright audio composition that is rendered mechanically, i.e. without a new live performance. Note: mechanicals are often confused with master rights (PPL) even by pros. Remember mechanicals are publishing. A more comprehensive description of American royalty exclusions can be found in All You Need To Know About The Music Business by Donald Passman (7th Edition). The application of American master and publishing rights is somewhat superficial compared to the EU. For example, Bill Silva mentioned in the Lefsetz newsletter recently (2010): SoundExchange does not collect from YouTube. SoundExchange was established to administer the collection and distribution of royalties from such compulsory licenses taken by non-interactive streaming services that use satellite, cable or Internet methods of distribution. YouTube would be considered an interactive service. SoundExchange collects performing rights for the recording master (the equivalent of PPL) but in a very limited way. This Economist chart (October 2010) shows societies in the EU collect about four times the royalties collected in America overall. (2010 population figures: EU 500 million, USA 300 million). Note also that Asia/Pacific in this diagram consists almost entirely of Japan and Australia. MCPS, PRS and PPL operate many different licenses. Even people who work there don’t know them all. You could take a degree in publishing and still not know every license. Blanket licenses for traditional duplication and performance are assigned to collection societies. A music user who buys a license can perform or duplicate relevant works under a standard set of limited conditions. Other music applications have separate licenses and some music users may need several. The best place to find complete up-to-date lists of these licenses is on the collection society sites. There is a longer list of performance licenses below. The JOL is a combined blanket mechanical and performance license for web sites distributing MCPS and PRS copyrights. This license allows the site to play music and make copies (downloads). There is no formal PRS opt out for sites run by writers (MCPS do have a formal opt out) but PRS say they won’t unreasonably charge not-for-profit or self-distribution sites. The JOL costs a minimum of £5,000 per quarter and a percentage (the intended rate is 12%) of site revenue. If a site isn’t using any MCPS or PRS copyrights they wouldn’t need a JOL but they should license the music from the labels and publishers. 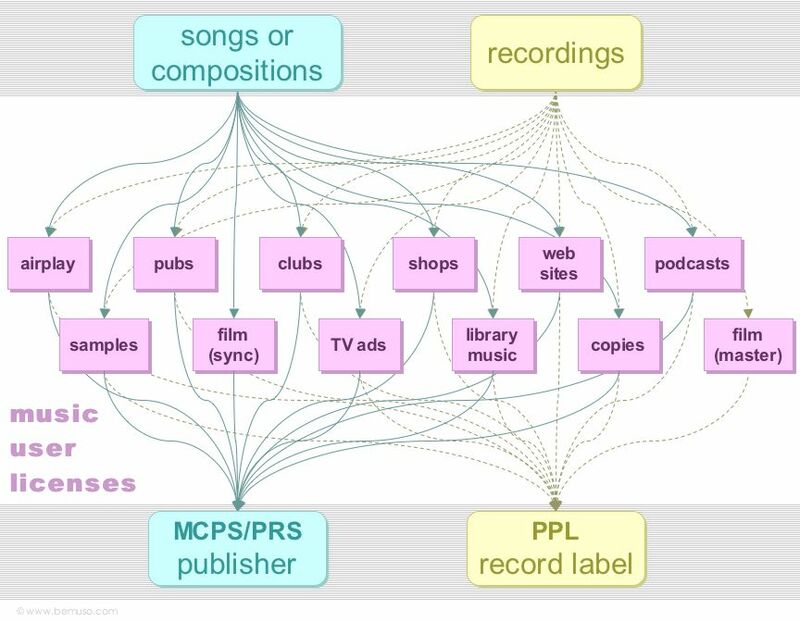 PPL, MCPS and PRS operate a joint blanket licensing scheme for library music. 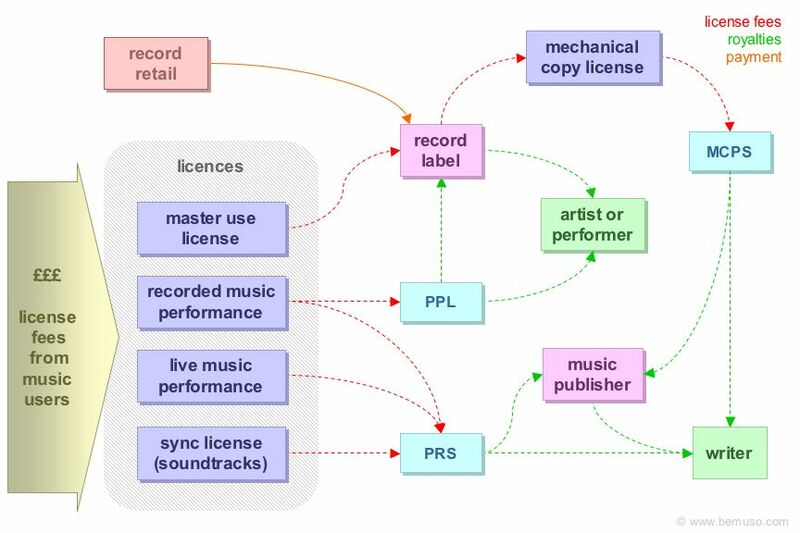 MCPS and PRS operate a joint blanket licensing scheme for sampled music but it doesn’t cover PPL, so sample users need to go back to the labels too. Ringtone publishing is licensed by MCPS (10% of retail) and PRS (5% of retail) but a master use license is also required. This PPL license allows you to make a DJ Database and one Back-up Database. It’s a phonographic copying license not a performance license. The DJ Database is simply a copy of one or more sound recordings in digital form which are stored solely on a single computer or hard disk unit up to 20,000 copies. The license doesn’t mention DJs specifically. Note: the Digital DJ license has now been superseded by a new joint MCPS/PPL Produb license with tariffs for DJs, exercise classes and other users. This is a PPL license for businesses that make intermediate copies of members’ copyright recordings, such as broadcasters. There is no blank media or file player levy in the UK. Individual rights-owners can collect royalties from music users but it would be impractical for each of them to license every music user in the territory separately. This is why royalty collection societies exist—to act as a one-stop-shop for music users. Equally, it would be impractical for societies to agree individual licenses with each of their rights-owners and each of their licensees. The solution is blanket licenses. Royalty collection societies offer a limited number of blanket licenses to both rights-owners and music users. This means a rights-owner cannot normally contract PRS to collect performance income from, say, hairdressers in Venezuela, and a music user will not find a license to use only Def Leppard and Celine Dion tracks in a computer repair shop. Blanket licenses are a compromise but there is normally a suitable version for most practical purposes. The alternative to a blanket license is a one-off license and there are some examples below. A master use license is a phonographic copyright license. Unless a work is included in a blanket license for film soundtracks, television, advertising or sampling (among other things) it will need a one-off master use license. There is no fixed rate for master use licenses, so commercial users must negotiate a fee with the label or the recording rights-owner. Phonographic performance royalties will normally be paid through PPL but music library tracks (unless licensed under the joint PPL, MCPS, PRS blanket license described above) don’t qualify. A sync license is a publishing license. Unless a work is included in a blanket license for film soundtracks, television or advertising (among other things) it will need a one-off sync license. There is no fixed rate for sync licenses, so commercial users must negotiate a fee with the publisher or the publishing rights-owner. Performance royalties will also be paid through PRS when the work is played in public. Grand Rights licenses are agreed between publishers and theatres for music written specifically for the stage. The fee is normally a percentage of the box office. Other music for the stage may be licensed through PRS. Soundtrack rights are often bought out in full, or up to some limit on the intended use(s) or volume by commercial users. Each buy-out license is agreed between the previous rights-owners and the new owners. Competition among project studio composers has led to a very tight market in instrumental music. Labels providing instrumental soundtracks, music libraries and catalogues now tend to buy their material outright, and their publishers may offer 50% or less. These are the main commercial music licensees and the people who get the royalties. The left hand column shows commercial users of music, and money moves from left to right. Here’s a good PRS poster showing additional pro bodies The Music Universe (if the link is broken search for PRS Music Universe). These are some of the blanket licenses granted by PPL and PRS to users of the copyright performances they administer. PPL also licenses broadcasters and suppliers of music to businesses.